All are available on the Web from our Toolkit Page. Videos for helmet campaigns. Sources for them, including three that are free! Developing A Children's Bicycle Helmet Safety Program: A Guide for Local Communities. A manual for helmet promotion programs included on the CD in the Toolkit (not on paper--it's too long!). Originally written by John Williams and the folks at Adventure Cycling, kept up to date here at BHSI. Frequently Asked Questions about helmets. Kids speak out on helmets. Summaries of medical journal articles. A summary of our Standards page. The helmets on sale this year. Our review of the most recent Consumer Reports helmet article. A chart and explanation of Mandatory Helmet Laws. A Buyers Guide to Bicycle Helmets. A Bicycle Helmet for My Child. How to Fit a Bicycle Helmet. NHTSA pamphlet: Prevent Bicycle Crashes. TransMadison's flyer with photos on How to Fit a Helmet. Bookmarks to print out and cut. Getting your kids to wear bike helmets. 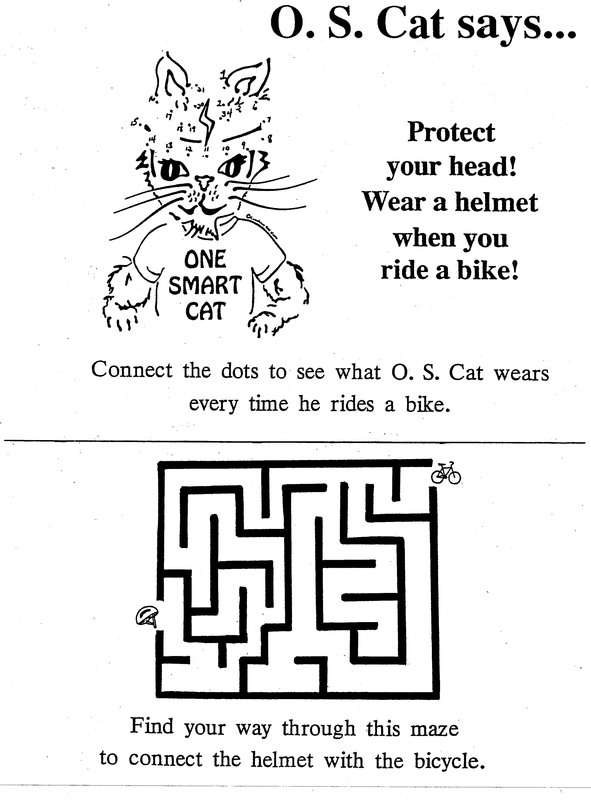 CPSC pamphlet: Which Helmet for Which Activity? A maze and a connect-the-numbers with One Smart Cat. A four page coloring book. Our CD includes a full copy of our entire Web site and the WABA Safety Site. Pop it in your machine and any browser like Internet Explorer or Firefox will use it as if you were connected to our Web site. You don't have to be connected to the Internet. The links to anything on our site work as they would if you were viewing it on the Web, but may be faster since the pages come from the disk. The videos below are described on our videos page. A DVD with the Canadian video "Bicycle Helmets 101"
A DVD with the Safe Kids Video "Jello in a Jar." A DVD with "Professor Helmut on Helmets." Two DVDs with DOT bike safety and helmet safety videos, including Spanish versions. Please let us know when you request the Toolkit if you don't need the videos. If you need the Toolkit, just email us at info@helmets.org. Be sure to give us a postal mailing address! We are usually quick to get the Toolkit out to you. If you can't wait for snail mail, here is the main printout that we send to you as a .pdf file. Add the pamphlet files above and you have it all except the DVDs. If your system will not download the .pdf file, email us and we will send it to you attached to a return email.